Is Scott Walker the Education Governor? You decide. At a recent event, Gov. Scott Walker called himself the “education governor.” You could almost hear the guffaws from Democratic gubernatorial candidates’ campaign headquarters. Gov. Walker recently declared himself to be the education governor, and his critics immediately pounced. Let’s take a look at the numbers. Let’s take a look at the numbers – you decide. We’re a long way away from 2011 and the governor’s very first budget bill, which cut state spending on education. That bill came on the back of the recession, when Wisconsin was facing a more than $3 billion deficit. While the state’s massive deficit has been in its rearview mirror for years, this Chicago native would like to remind our readers that balanced budgets are not a given. Facing falling revenues, Democratic Gov. Jim Doyle’s 2009 budget hiked state taxes by $2 billion, property taxes by $1.5 billion, and cut state aids to K-12 education by $284 million. It’s interesting how often those on the left turn straight to Walker’s very first budget, ignoring what had happened just two years prior. Facing a crisis, Walker cut state funding to schools – while also giving them the tools to make up the lost aid, including opening up healthcare plans to new bidding. Selective memory is a funny thing. More importantly, Walker’s critics largely ignore the events of the past seven years. 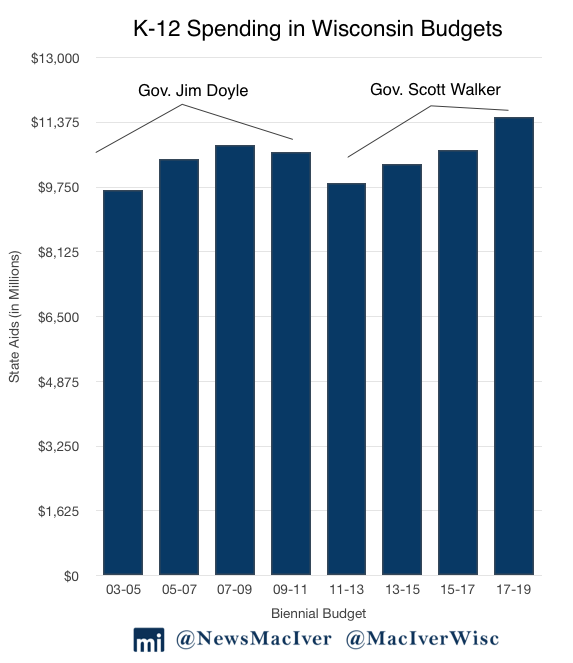 There’s no ignoring the $636 million increase in state aids in the 2017-19 budget, nor the many other positive steps Walker has taken for education in Wisconsin. Thousands upon thousands more students have access to the school of their choice. The $11.5 billion in general and categorical aids towards K-12 education in the two-year budget is an all-time high. The left-leaning Politifact declared that the claim paraded by Walker’s opponents – $1 billion ‘stolen’ from public schools – is “mostly false.” Yet Wisconsin Democrats, surprisingly slow on the uptake, keep stubbornly using the number. There’s some kind of special irony in Tony Evers – Superintendent of Public Instruction – continuing to use the fake stat. It’s this kind of stubbornness that degrades the conversation for all of us. Take, for example, Democrats’ continued opposition to Act 10, Walker’s landmark budget repair bill. In the first five years after the bill was passed, school districts have saved $3.2 billion in benefits alone, according to the Department of Administration. Critics might argue that those savings were achieved on the backs of education employees. Yet, in the years leading up to Act 10, Wisconsin’s state and local government employees made an average of 19 percent more than their peers in the private sector. Those critics should open up some audit books and examine their district’s own budgets to take a look at the investments districts have been able to make because of Act 10’s cost savings. Act 10 is still an easy scapegoat for many partisans, but its tools, like the ability to open up bidding for new healthcare plans, have been helpful to school districts – as inconvenient as that may be for the partisans. Milwaukee Public Schools, for its part, restructured fringe benefit plans and saw falling benefit expenditures for several years. The district’s debt problem is again on the uptake, but per its 2018-19 budget documents, retiree healthcare liabilities stood at $2.8 billion just a few years ago and are at less than $1 billion today. Put in the context of a billion-dollar annual budget, that kind of restructuring matters. As we’ve reported, the district is far from long-lasting financial solvency, but ultimately, the situation for taxpayers could’ve been much worse without Act 10’s tools. In this status quo, traditionalist system built on borders and artificial caps, thousands of students were underserved. Those with less privilege, power, and money – for example, minorities in Madison Metropolitan School District, which has among the state’s biggest achievement gaps – were locked out of the system. MPS has 80 schools that are failing or “meet few expectations,” trapping over 38,000 children in poor-performing schools. Since the beginning of his tenure, Gov. Walker has expanded choice programs to give these kids a fighting chance. Today? Milwaukee’s parental choice program no longer has an enrollment cap, is accessible to families earning up to 300 percent of the federal poverty line, and schools have no more geographic requirements. Last year, almost 28,000 students voluntarily participated in the program. Choice programs in Racine and statewide are also thriving. 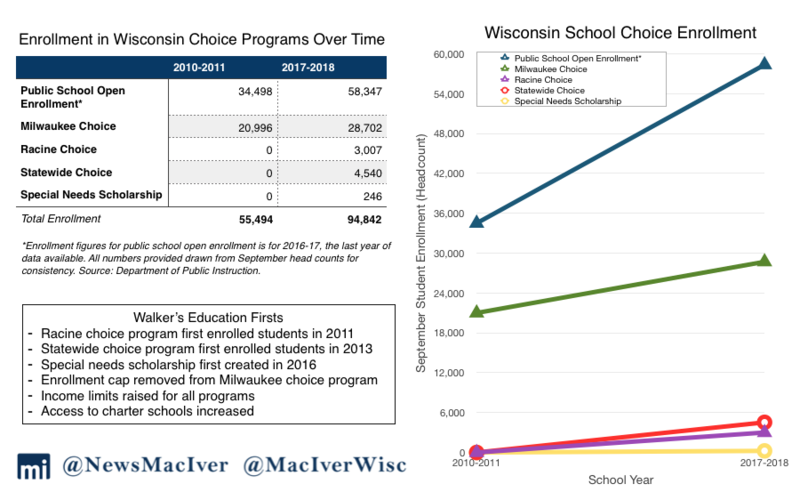 In the 2013-14 school year, just over 500 students in 25 schools participated in the Wisconsin Parental Choice Program. Four years later, in 2017-18, 4,540 students in 154 schools have access to schools they couldn’t otherwise afford. That’s real progress. Racine’s program enrolled just over 200 students in the 2011 school year – a number that now stands just under 3,000, a 1,270 percent increase in student participation. The Special Needs Scholarship Program is about celebrate its third birthday, with 84 schools participating in the coming school year. What do Walker’s Democratic challengers for governor propose? Every single candidate would phase out the choice programs, either by freezing enrollment, phasing out access, or some other bureaucratic tinkering in favor of the traditional system. That’s a slap in the face to every family – mostly minorities – who fled their schools looking for better service. This is a group of people largely running to the left of traditional Democratic candidates. Equity, access, and progressivism? Not for the tens of thousands of students who benefit from schools they otherwise wouldn’t afford. Democrats get to claim that they care more about education and choice, then rip families away from their preferences, putting them back in neat little boxes based on geographic boundaries. The hypocrisy is palpable. The last thing Wisconsin families need is for more students to be forced back into classrooms based on arbitrary bureaucratic lines and borders. As they wring their hands over declining enrollment in traditional school districts and propose phasing out school choice programs, that’s exactly what Democratic gubernatorial candidates want. As for Walker’s education record – four-year high school graduation rates are up, from 87 percent of students in 2011 to 88.6 percent in 2017. Every public school student in Wisconsin now takes the ACT, increasing the percentage of students taking the college entrance exam from 61 percent to 92 percent. After much debate, the state finally settled on a new standardized exam to replace the long-criticized WKCE, so the public can have more faith in the accuracy of proficiency numbers, though they remain far too low. But all that is just a footnote to thousands more families being able to choose where to send their kids to school. Increased access to education is Walker’s signature education achievement. In a state where achievement gaps and failing schools still plague many of our students, that access can’t be overstated. According to our own DPI, nearly 25,000 students attend 46 failing schools in Milwaukee. Another 34 schools that “meet few expectations” enroll almost 14,800 students. In other words, 80 out of 138 MPS schools – enrolling 53 percent of the district’s student body – are skating by while we graduate our kids up and out of the system, barely giving them a fighting chance. The last thing we need is for more students to be put back into classrooms chosen by bureaucrats instead of families. Walker’s critics will continue their nickel-and-dime attacks about public school funding, and clearly taxpayers can never shell out enough to make them happy. But by expanding access to the education of a family’s choice, Walker has kept his eye on the big picture. He deserves kudos for that.